FIFA president Sepp Blatter believes referee Howard Webb had a "very hard task" in the World Cup final between Spain and Holland that saw a record 14 yellow cards shown. In a record for a final, Webb booked 13 different players - John Heitinga was shown two yellows followed by a red - in a fiery encounter that saw Andres Iniesta's extra-time goal secure a 1-0 win for Spain. 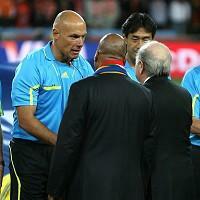 Blatter said: "The final was not exactly what I expected in terms of fair play. It's not up to me judge the performances of the officials, I can only say it was a very hard task that the referee trio had on the field of play."